If there’s one thing Paul DeVeaux and I agree on, it’s that DC lacks what some other major cities don’t – a movie about “us.” There is no such recounting of District life from the perspective of an actual resident — or least none that come to mind at a moments notice. We’ve seen the White House blown up more times than we can count (anyone remember “2012″ or “Independence Day?”) and we’ve borne witness to the ups-and-downs of the political game thanks to “All The President’s Men” and “Mr. Smith Goes to Washington,” but what about a movie recounting the lives of all the folks putting their blood, sweat, and tears into making this the city what it is. DeVeaux, who’s been a District resident on and off again for 10 years, has settled since his 20s and now has a family to call his own. But before that he was a 20-something rugby playing, legal assistant working the DC job market who frequented the Adams Morgan night scene with his buddies. 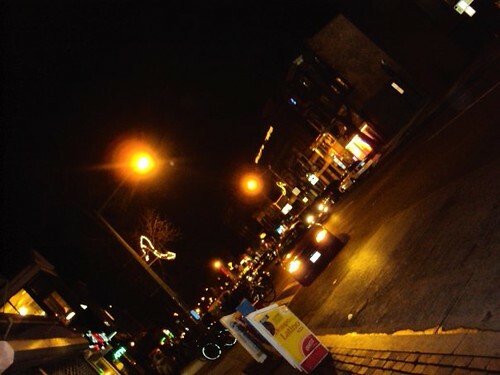 Adams Morgan is a hopping social scene at both day and night. It’s the home to drinking, open mics, rugby games, concerts, art shows, street festivals, jumbo slice and empanadas. DeVeaux knows that. We know that. Our friends who come in from out of town to visit us even know that (and this is despite the fact that we forced them to go out and visit Adams Morgan in the first place). 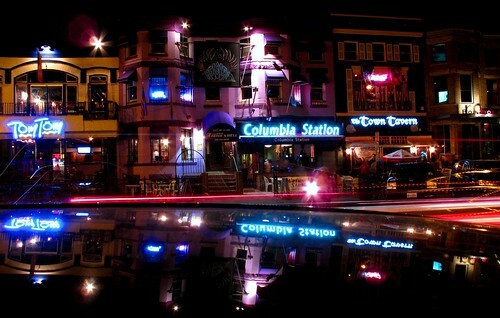 Adams Morgan is another character in the movie as far as DeVeaux is concerned. That, along with his three male leads and three ladies to keep them occupied, is enough to make anyone’s head spin. Six main characters makes it a little hard to keep up with the storyline, but it’s a possible feat to accomplish. The biggest problem I have with the movie is that it wasn’t what I thought it would be – at all. Now don’t get me wrong, I like a good chick flick just as much as the next 20-something girl who likes to sit home on an occasional Saturday night with some Ben & Jerry’s and “The Notebook,” but for a movie with a male writer, the movie’s depth fell a little short to me. There was no footage of the infamous Halloween bar crawl. A few of the characters end up at the Drag Race (which we all have to admit is DC experience in itself) but that’s the extent of any outlandish partying that occurs. The rest of the movie is a giant “he cheated on her, she wants to cheat on him, their marriage is on the rocks, but oh wait — puppy love may or may not be on the horizon” aka a giant blending of way too many relationships at one time. It was really hard to keep track of who was doing what and how they were all connected. To keep it simple: there were too many relationships to keep track of. Granted, this is DeVeaux’s first foray into script writing and movie production. So for tha tI say “Kudos, it was a good rookie run. You represented your city well.” However, I was expecting more of a “Tucker Max Goes To Washington” and not a laundry listing of why every character in the movie will find themselves in couples therapy one day. If you’re looking for the District’s version of “The Hangover”, this isn’t it. The movie might be NAMED after DC’s most loved and loathed watering hole, but it’s really just what DeVeaux calls a cool and quirky backdrop for a humorous look at relationships. All that aside, the film’s production and writing was a good enough for a man who has never done a movie in his life. The acting was also a strong force, bringing DeVeaux’s cherished 20s back to life. What was the hardest part about making the movie? DeVaux says it’s a mixture of being able to divorce yourself from the piece and putting your personal feelings aside while still writing what you know as you know it. This is his first movie. “It’s funny”, he said, “my 8-year-old daughter has even written a script.” As a father, DeVeaux sees know greater joy from writing this movie than having his daughter follow by example. “If this movie doesn’t go anywhere, it’s nice to know I have family support,” DeVeaux laughed. 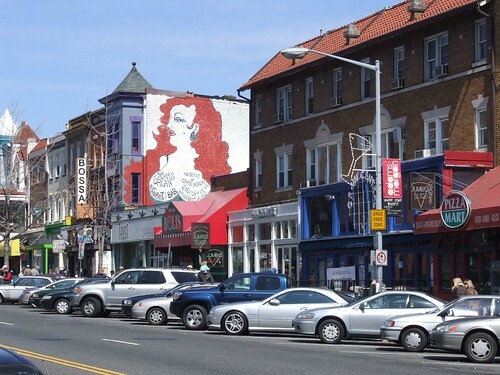 There’s more to DC than the monuments and business – and “Adams Morgan: The Movie” is definitive proof of that. Now here’s the good news and the bad news, bad news first: “Adams Morgan: The Movie” is not scheduled to be shown in any major movie theaters … yet. They’ve sent it out among the independent circuit and have been issued a spot at the 2010 DC Shorts Film Festival. Other than that, DeVeaux and his team are submitting their baby to countless other film festivals throughout the country, hoping to snag a few spots in the coming months. So what’s the good news then? There’s a screening part of the movie RIGHT HERE IN TOWN ON SUNDAY at Bottom Line Saloon! For more details, visit their Facebook page or check back with us in the coming days. Anyone can attend. ‘St. Elmo’s Fire’ comes to mind. You’re so right Michael. Good call. I have a feeling my age is one of the reasons I didn’t have that one on the tip of my tongue. Thanks for pointing it out! Do women typically write significantly more shallow movies enough that it warrants this comment? Or maybe (hopefully) I’m misinterpreting it. @Kristen Fair assessment! What I was trying to get across was that for a relationship-based movie written by a man, it fell short of my overall expectations of what was actually shown on screen. To be honest, I see how the statement could be interpreted on many levels, so I apologize for any confusion! Thanks for reading/commenting! I’ve read the script. It’s very poorly written. Not good at all.